Before leaving on any trip the first thing I do is pack my knitting bag. 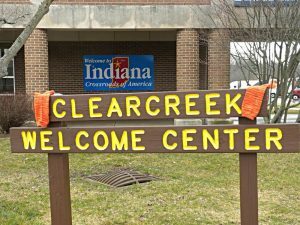 My clothing gets shoved in the backpack in a matter of minutes, which explains a lot about why I often end up packing the wrong clothes for whatever weather we encounter, but the knitting gets special attention. This was to be our last getaway for fun before our busy season takes up all of our time. There will be plenty of driving to and from shows in the coming months, but this was to be a road trip for its own sake. Plus, Hillarey is an intern in New York. Actually that’s the real reason for all of this. Our first night was spent hanging out with a friend of Christopher’s from high school and we had a good time in the Soulard district of St Louis. Early the next morning we were back on the road though. 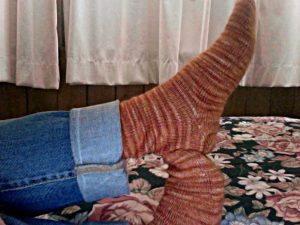 On the second day on the road I finished the Bittersweet DVD socks. The plan was to finish these first so I could wear them on the trip. They fit perfectly and I did wear them several times under boots on cold days. 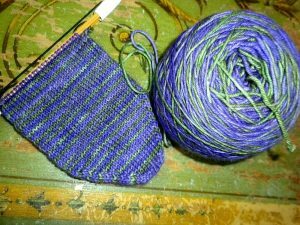 I’ve had numerous requests for the DVD Sock pattern. The pattern – or recipe if you will – is almost ready for release. Check here later this weekend for a notice and a link to download it for free. Edited to add the LINK to the new DVD Socks pattern! Our next big stop was in Tivoli, New York. Last year we had four cross-country bicycle tourists stay with us who had recently graduated from Bard College in upstate New York. We had a quick surprise reunion in Tivoli, NY with Paul, one of the bicyclists. Here Paul is posed in front of the Tivoli Bread and Bakery with his lovely girlfriend Leora. As we drove away I told Chris that I think we’ll see Paul again someday. Maybe it’s wishful thinking but I’d like to keep in touch with him. We drove south after leaving Tivoli. The lovely rolling hills of upstate New York gave way to traffic before long. One panicky misguided turn in Queens sent my heart racing. A few quick maneuvers and we were on the right highway again heading to Long Island to see Hillarey. This is about the point where my camera was forgotten. Yes, really. Our stay with Hillarey was hardly documented. It was however, wonderful. I don’t, as a rule, worry too much about Hillarey. She’s level headed, smart and can take care of herself quite well. But I do miss her. On the second day in New York City we rode the train into the city to visit the Museum of Modern Art. Having an art student as your guide is great, especially when that art student is interning at a gallery whose artists’ work appear on the walls and in installations at the museum. It’s like getting the insider’s tour. Throughout the day Hillarey showed us around New York. We wandered the Garment District peeking in shops. We people watched too. 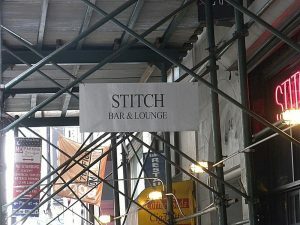 I spotted this sign and thought it’d be a good home away from home for my friends the Beerknitters. It was cold, and a wet cold at that. Another result of hasty clothing choices had me walking the streets of New York trundled in a cardigan instead of a coat. ::shrug:: I did at least have a pair of mittens and a shawl to tie around my neck. Hillarey located several very cool button shops for us to visit. That’s something I love about New York — there are SO MANY PEOPLE that someone can set up a button shop and there are enough people to keep him in business. 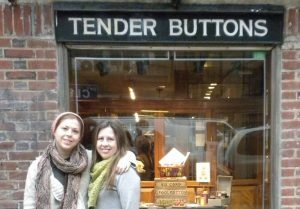 My favorite was Tender Buttons. The shop was a small narrow space with one long wall filled with boxes holding a bizillion buttons of every size, shape, and make imaginable. I was giddy with delight!! I could have spent hours in this shop, and hundreds of dollars too. But I restrained myself and brought home only two different types of buttons. 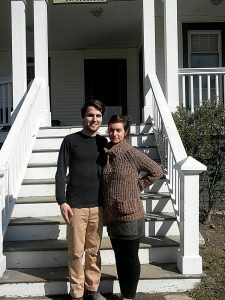 The next day we pulled away from the house where Hillarey is living on Long Island and headed south again. There were no tears when we left. 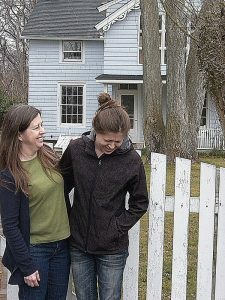 There was laughter though, along with a deep and satisfied feeling that my little girl is doing well. It’s strange that my missing her is soothed by knowing this. Maybe it’s what happens when mothers accept that their children are no longer theirs, that they are their own person. She’s not my little girl anymore, she’s a woman in her own right. I knew this already but seeing her in her element made a strong impression. My daughter is an artist living in New York. That makes me both proud and happy. She’ll be home in the late summer for her last semester at OSU. It’ll be good to have her back, whether she stays in Oklahoma or not. Our next stop was Philadelphia and several nights with a friend of Christopher’s from college. Hillarey had told me about Fiber Philadelphia, which is a city wide event hosting art exhibits all related in some manner to fiber. It was extraordinary!!! At the Crane Gallery there were numerous small exhibits and after the first few photos I slipped my camera in my purse and just strolled through the different galleries staring in wonder at the fabulous creations. My favorite installation was at the Moore College of Art and Design downtown. Shizuko Kimura sketches intricate portraits and nudes using silk thread on panels of loosely woven muslin. The detail of these sketches was astonishing! Please click the link above to see examples of her work. Art museums and exhibits are incredibly inspiring. One never knows exactly where ideas come from. Taking a bit of what we see in one work of art (or image of nature) and twisting it in our own way with our preferred tools and our personal skills, then combining it with something else entirely can yield a whole new creation. I made several sketches on this trip and I hope that at least one or two becomes a tangible project at some point. Our stay in Philadelphia was short but a lot of fun. Our hosts built the most amazing bonfire I’ve ever encountered. We ate well, and had a good time visiting. Philadelphia is a little less hectic than New York but still I was ready to come home. Big wide open spaces called to me. I missed my dogs and I missed working in my studio. 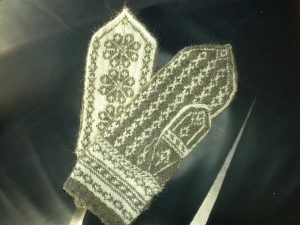 Having finished the second Climbing Rose Mitten on the way across Tennessee I knit lace. The Torreyana that I’d cast on weeks ago had stalled due to lack of interest. 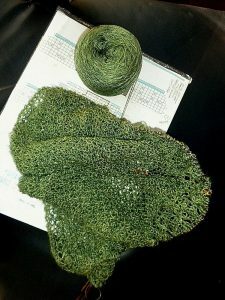 Before we left the farm I’d frogged the green silk and grabbed the pattern for the Laminaria Shawl and put both in a project bag. The new silk Laminaria quickly grew as we traveled. The little Star Flowers are addictive and fun. I even finished the Transition Chart on the road. As we drove westward our farm was being hammered with a band of thunderstorms that seemed on radar to be hovering over Oklahoma and Texas. As we got closer we began to worry about actually getting all the way home. Clear Creek bisects our farm and in a storm of this magnitude it tends to flood. By the time we reached Arkansas we were pretty much assured that we’d not be able to cross any of the three roads into the farm. We instead headed to Chris’s father’s apartment in Tulsa. Not exactly like sleeping in our own bed, but a close second. Looks like it was a fantastic trip!